Heavy Metal is often mocked for its shallow stupid music and posing musicians. The movie This Is Spinal Tap did a good job showing what too much of this music can be like; pretentious, absurd, and idiotic. The documentary Decline of Western Civilization pt II shocked people with its frank portrayal of metal life, particularly the self destructive horror of Chris Holmes from WASP. Yet at the same time, heavy metal can have some of the most intelligent, interesting, and learned songs in rock and roll. From Metallica's One to Queensryche's "Operation MindCrime," metal covers a broad range of subjects other than Satan, chicks, and motorcycles. Even mindless bands like Motley Crue had songs like Dr Feelgood. And Iron Maiden returned again and again to literary and interesting topics such as the myth of Icarus, fear, and this song. Samuel Taylor Coleridge wrote a poem in 1798 about sailing ships and the men in them which became a classic very rapidly and affected our language significantly. 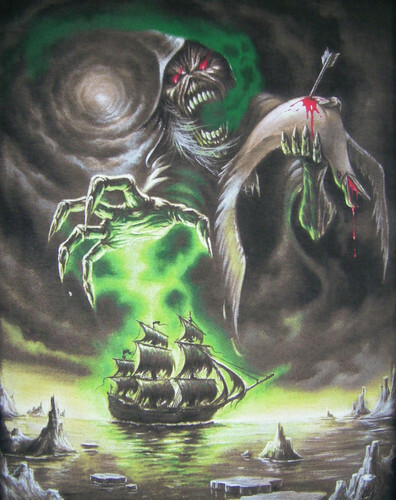 Called Rime of the Ancient Mariner, it told the tale of a man who was cursed and the horror that curse wrought on not only his life but those around him. The poem is packed with symbols and imagery that many know but few recognize the origin of these days. An albatross hung around the neck, "water water everywhere but not a drop to drink," and so on are all from this poem. The poem tells the tale of a wedding party which is rudely interrupted by a crazed, bearded old man who tells a frightening tale. A sailor he was, on a ship in fog and ice near the shore and all hands feared loss. They spotted an albatross, considered good luck, but the mariner shot it dead out of a demented thought it was their tormenter. Cursed by the death of the albatross, the mariner's woes take down the entire ship. They are becalmed in deep blue, run out of water, run out of food, and one by one the ship's crew dies, but death does not take the mariner. The idea of a "Jonah" aboard a ship was common, particularly in those days - a man cursing the ship with bad luck (see Master and Commander: Far Side of the World for an example of this legend). The mariner continues having misery until one day finally he meets a holy hermit who removes the curse and he finally is free of it. And Iron Maiden decided to turn this into a thrashing heavy metal epic ten minutes long. They retained many of the lines, and told a pared down version of the tale with several movements of different musical styles, all driven by Bruce Dickinson's distinct voice and the talented musicians of the band. Mock heavy metal if you will - and much of it richly deserves mockery - but among the hair bands and posing death metal fools are gems that will astonish you. Check the embed coding on the first vid. If I had the time and inclination I'd make the text area fatter and add a third column to the template but I have neither.